A review of methods and technologies available and those on the horizon. • Intravitreal injection is the current drug delivery method of choice. • Topical drug delivery offers easy administration, but ocular bioavailability is limited; less than 5% of the dose reaches deeper ocular tissues. • Emerging technologies, including nanotechnologybased intravitreal approaches, scleral-fixated slow-release implants, and suprachoroidal delivery strategies, may provide targeted drug delivery with superior durability. Drug delivery to the posterior segment of the eye is an area of intense investigation and immense potential. 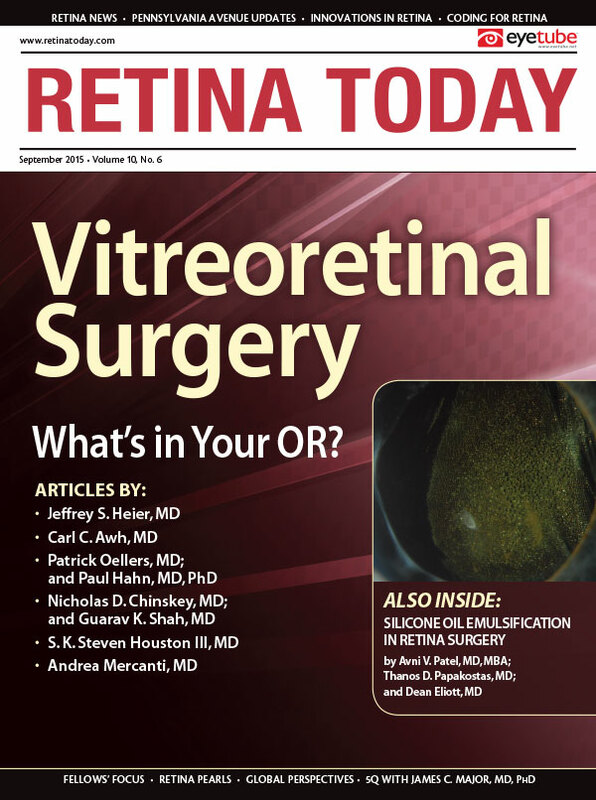 Despite the emergence of effective drugs to treat a variety of retinal diseases, surgeons still grapple with how best to administer these sight-saving medications. An ideal route of administration would deliver therapeutic levels of drug to targeted tissues in an exceedingly safe fashion while providing minimal disruption to the quality of life of the patient. This review touches on the present state of drug delivery technology and provides a glimpse of technologies in the pipeline. The current delivery method of choice is intravitreal injection, which has a positive safety and efficacy profile. Dosing by this route provides a large initial bolus of drug beyond therapeutic levels, which then clears rapidly. Intravitreal injections typically require frequent visits by patients who may be of advanced age or in poor health, and there is associated discomfort. The expansion of treatment indications and an aging population have deepened the treatment burden both for patients undergoing frequent injections and for the providers trying to accommodate such treatments. Currently available intravitreal therapeutics have demonstrated impressive efficacy and safety with modest durability. Research efforts have been aimed at manipulating the vehicle for delivery of these agents, in order to create a drug delivery platform that optimizes efficacy and increases durability. Other approaches to drug delivery involve implanting a device to provide slow release of drug over an extended period of time. Several novel approaches have been undertaken in this arena. An encapsulated cell technology platform, NT-501 (Renexus, Neurotech), contains genetically engineered retinal pigment epithelium (RPE) cells from a human cell line that are capable of producing a therapeutic factor. The immunologically isolated cells are housed within a semipermeable polymer capsule that is sutured to the sclera and allowed to secrete the therapeutic factor in a continuous fashion over an extended period of time. The NT-501 implant secretes recombinant ciliary neurotrophic factor. A phase 2 study in patients with geographic atrophy did not reveal any safety concerns.4 With a similar strategy, Neurotech’s NT-503 uses engineered RPE cells capable of producing a VEGF receptor Fc-fusion protein for the treatment of neovascular AMD, and the company’s NT-503/506 targets both VEGF and platelet-derived growth factor (PDGF) receptors for neovascular AMD. The ODTx device (On Demand Therapeutics) is a biocompatible, nonresorbable, injectable implant that contains multiple discrete reservoirs to store and protect small- or large-molecule drugs. The device is activated by a standard laser, which can be used to create an opening in an individual reservoir to release the drug. The Port Delivery System, developed by ForSight Vision4, has been licensed by Genentech/Roche for delivery of ranibizumab (Lucentis, Genentech). It is a scleral-fixated, nonbiodegradable drug delivery implant designed to provide sustained release of drug into the vitreous over a period of months. One of its appealing features is its ability to be refilled via transconjunctival injection. Following completion of a phase 1 trial for treatment of neovascular AMD, the Long-Acting Delivery of Ranibizumab (LADDER) study will further evaluate this technology. The Replenish MicroPump (Replenish) is an implantable device based on microelectromechanical systems engineering, containing a drug reservoir with a refillable port, battery, and electronics. It is implanted in the subconjunctival space, and a flexible cannula is inserted through an incision into the posterior segment to release nanoliter doses of drug at a programmed interval. The topical route of drug delivery is attractive because of its ease of access and administration. Unfortunately, numerous anatomic and physiologic constraints limit ocular bioavailability, and less than 5% of a topically applied dose reaches the deeper ocular tissues.5 To improve efficiency, strategies such as the use of prodrugs and permeation-enhancing nanoparticles have been developed to optimize penetration. The use of viscosity enhancers can increase drug contact time on the cornea and hence drug release to the posterior segment. Several other molecules for topical delivery have been developed to inhibit VEGF activity. Regorafenib (Stivarga, Bayer HealthCare) is a multikinase inhibitor packaged in an oily suspension formulation for improved delivery. After a successful phase 1 trial to determine tolerability, a phase 2 study is under way. PanOptica is testing PAN-90806, a small-molecule selective VEGF receptor antagonist, as a topical treatment for neovascular AMD in a phase 1 trial. Aganirsen (GS-101, Gene Signal) is an antisense oligonucleotide that inhibits insulin receptor substrate-1 expression. In the I-CAN phase 3 trial, topical aganirsen reduced the relative area of corneal neovascularization in patients with keratitis.7 The compound is being prepared for phase 2 trials in patients with AMD and DME. Iontophoresis is a noninvasive method designed to improve the penetration of a charged compound across membranes. For ocular drug delivery, an electrical current is applied across the eye to facilitate drug penetration. Iontophoresis has been combined with nanoparticle delivery systems to improve penetration.8 Several systems are available for iontophoresis, including the Eyegate II (EyeGate Pharma), OcuPhor (Iomed), and Visulex (Aciont) delivery systems. Periocular drug delivery via the transscleral pathway is a safe means of achieving therapeutic drug levels, but it is limited by a steep drug concentration gradient, with high concentrations in the sclera and lower concentrations in the retina. Pontes de Carvalho et al have described an episcleral drug reservoir to allow transscleral delivery.9 They juxtaposed a silicone exoplant to the sclera that provided an avenue for transscleral delivery while limiting exposure to washout by the conjunctival vessels. This delivery system is being evaluated for the treatment of posterior segment diseases and glaucoma. The suprachoroidal space is an intriguing target for drug delivery. Administration of drugs into this space can potentially enable their access to the choroid and retina while limiting exposure to the anterior segment. In 2002, Einmahl et al described an injection of a biodegradable polymer gel into the suprachoroidal space in rabbits.10 Olsen et al described a novel surgical technique for delivering triamcinolone to the posterior pole via cannulation of the suprachoroidal space.11 In porcine and primate models, they noted successful delivery of triamcinolone to adjacent tissues that lasted 120 days. Hollow microneedles have been used to access the suprachoroidal space in the office setting. Patel et al reported a minimally invasive technique using a hollow microneedle to penetrate the sclera and terminate in the suprachoroidal space.13 Clearside Biomedical has initiated separate phase 2 clinical trials using their microinjector technology for patients with macular edema secondary to uveitis or RVO. In the RVO trial, patients receive aflibercept (Eylea, Regeneron) with or without suprachoroidal triamcinolone acetonide. Ocular Therapeutix has used polyethylene glycol (PEG) to encapsulate drug-loaded microspheres that can be tailored to deliver sustained levels of drug at a therapeutic dose. The PEG bioresorbable hydrogel creates a tight meshwork that can trap anti-VEGF molecules. The PEG hydrogel and anti-VEGF molecules are injected, and, as the hydrogel degrades via hydrolysis, the mesh size increases and anti-VEGF particles are gradually released. Daniel D. Esmaili, MD, is a retina specialist in private practice at Retina Vitreous Associates Medical Group in Los Angeles, Calif. Dr. Esmaili may be reached at desmaili@laretina.com. David S. Boyer, MD, is a clinical professor of ophthalmology at the University of Southern California Keck School of Medicine, Department of Ophthalmology, in Los Angeles, Calif. He is a member of the Retina Today Editorial Board. Dr. Boyer may be reached at +1-310-854-6201 or vitdoc@aol.com. 1. Jaffe GJ, Martin D, Callanan D; Fluocinolone Acetonide Uveitis Study Group. Fluocinolone acetonide implant (Retisert) for noninfectious posterior uveitis: thirty-four-week results of a multicenter randomized clinical study. Ophthalmology. 2006;113(6):1020-1027. 2. Boyer DS, Yoon YH, Belfort R Jr, et al. Three-year, randomized, sham-controlled, trial of dexamethasone intravitreal implant in patients with diabetic macular edema. Ophthalmology. 2014;121(10):1904-1914. 3. Campochiaro PA, Brown DM, Pearson A, et al. Sustained delivery fluocinolone acetonide vitreous inserts provide benefit for at least 3 years in patients with diabetic macular edema. Ophthalmology. 2012;119(6):2125-2132. 4. Zhang K, Hopkins JJ, Heier JS, et al. Ciliary neurotrophic factor delivered by encapsulated cell intraocular implants for treatment of geographic atrophy in age-related macular degeneration. Proc Natl Acad Sci U S A. 2011;108(15):6241-6245. 5. Gaudana R, Jwala J, Boddu SH, Mitra AK. Recent perspectives in ocular drug delivery. Pharm Res. 2009;26(5):1197-1216. 6. Ohr Pharmaceutical announces final topline data from OHR-102 phase II IMPACT study in wet-AMD; 2015. Available at: http://www.ohrpharmaceutical.com/media-center/press-releases/detail/444/ohr-pharmaceutical-announces-final-topline-data-from. Accessed August 27, 2015. 7. Cursiefen C, Viaud E, Bock F, et al. Aganirsen antisense oligonucleotide eye drops inhibit keratitis-induced corneal neovascularization and reduce need for transplantation: the I-CAN study. Ophthalmology. 2014;121(9):1683-1692. 8. Eljarrat-Binstock E, Orucov F, Aldouby Y, et al. Charged nanoparticles delivery to the eye using hydrogel iontophoresis. J Control Release. 2008;126(2):156-161. 9. Pontes de Carvalho RA, Krausse ML, Murphree AL, et al. Delivery from episcleral exoplants. Invest Ophthalmol Vis Sci. 2006;47(10):4532-4539. 10. Einmahl S, Savoldelli M, D’Hermies F, et al. Evaluation of a novel biomaterial in the suprachoroidal space of the rabbit eye. Invest Ophthalmol Vis Sci. 2002;43(5):1533-1539. 11. Olsen TW, Feng X, Wabner K, et al. Cannulation of the suprachoroidal space: a novel drug delivery methodology to the posterior segment. Am J Ophthalmol. 2006;142(5):777-787. 12. Tetz M, Rizzo S, Augustin AJ. Safety of submacular suprachoroidal drug administration via a microcatheter: retrospective analysis of European treatment results. Ophthalmologica. 2012;227(4):183-189. 13. Patel SR, Lin AS, Edelhauser HF, Prausnitz MR. Suprachoroidal drug delivery to the back of the eye using hollow microneedles. Pharm Res. 2011;28(1):166-176. 14. Patel A, Cholkar K, Agrahari V, Mitra AK. Ocular drug delivery systems: an overview. World J Pharmacol. 2013;2(2):47-64. 15. Barza M, Baum J, Tremblay C. Ocular toxicity of intravitreally injected liposomal amphotericin B in rhesus monkeys. Am J Ophthalmol. 1985;100(2):259-263. 16. Abrishami M, Zarei-Ghanavati S, Soroush D, et al. Preparation, characterization, and in vivo evaluation of nanoliposomes-encapsulated bevacizumab (Avastin) for intravitreal administration. Retina. 2009;29(5):699-703. 17. Zhang L, Li Y, Zhang C, Wang Y, Song C. Pharmacokinetics and tolerance study of intravitreal injection of dexamethasone-loaded nanoparticles in rabbits. Int J Nanomedicine. 2009;4:175-183. 18. Lim JI, Fung AE, Wieland M, et al. Sustained-release intravitreal liquid drug delivery using triamcinolone acetonide for cystoid macular edema in retinal vein occlusion. Ophthalmology. 2011;118(7):1416-1422.